Actually, without adequate energy consumption per capita, the popular type of economy moves from Capitalism to Fascism. It’s probably a challenge that will only get more challenging as the chasm gets wider, unless campaign financing reform takes place, so politicians have incentive to be concerned about regular people again instead of just big money donors. The problem behind income inequality is the laws of physics. When there is not enough to go around, the economy needs to “freeze out” the least productive portion of the economy, and at the same time distribute what little wealth is available to the already-wealthy. This assures that some can survive the current bottleneck, even if all cannot. We may not like this outcome, but this is the way the physics-based system is designed to work. 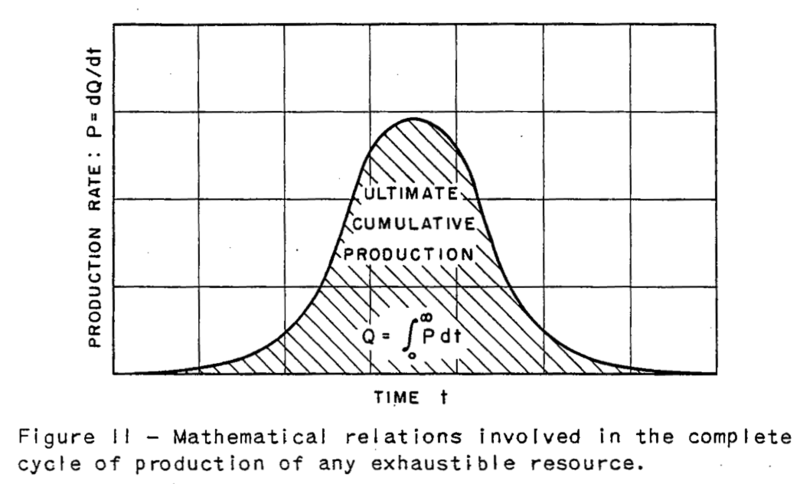 Distributing the wealth evenly to all is a formula for running through what resources are available quickly. It is popular with voters, but it cannot really work in the real world, unless everyone is working and there is virtually no “complexity” –roads, pipelines, electricity transmission, computers. Even wealth can go with a hunter-gatherer society, but not much beyond that. No kidding! They clearly need higher prices. More debt doesn’t fix the problem. This is another one of the “electric vehicle” articles. If the price of oil is unaffordable, demand growth goes to zero right now. This has nothing to do with electric vehicles. Just a comment – when someone compares year-on-year data (housing, etc), there must be growth because (1) inflation and (2) population growth. So, if the growth is less than the combined inflation and population growth, then it is “bad” for the economy. It does not mean that the growth has to be negative to be “bad”. Technically, a few quarters of very low or zero growth is more than sufficient to cause problems. Same goes for whatever numbers that is bandied around like the USD1T that China has in reserves. It does not mean that it has to go from 1T to 0T in order to be “bad”. Just a drastic drop will do as they have a minimum number that they need to maintain/use in which we have no idea what that number is. Good points! This is one reason I keep going back to “per capita” numbers and economists keep talking about “real” (inflation adjusted) growth. When it comes to world economic growth, there is also the issue that China, India, and other developing countries are given very large weights in the calculation, even these countries likely have optimistic estimates of what their growth rate really is. This gives an upward bias to reported world GDP. On the other hand, at least at the church I attend, attendance is up. Today was very close to standing room only. Perhaps the “technology will save us” story is wearing thin. We need a guiding story; technology will save us won’t work. More goods and services for everyone, made with limited oil (and other energy) supplies, doesn’t really work, either. Perhaps a different guiding story is needed. Religions have long provided guiding stories. They have talked about moderating our own desires for goods and services. They have talked about sharing (at least within our own in-group) with those less fortunate than ourselves. The “equal goods and services for all” story is appealing, but it doesn’t work under the laws of physics. It lets those who are not producing goods and service get as much as everyone else. This tends to deplete resources too quickly; it doesn’t reward adequately those who are contributing to the overall effort. Religions have passed on the understandings of the day as to what arrangements “work” and satisfy the needs of the system. As more energy is available, different systems work, and we seem to think that they will always work. For example, with more energy, women can play a bigger role. They can have their own cars; contraceptives can limit births. But if transportation and jobs are limited, and death rates from childhood illnesses are higher, then the system has to shift away from the system that practically everyone believes is the “right” system to something else that uses much less energy. It will take a new guiding story, perhaps from a religious perspective, if it is to be at all possible to transition to a lower energy economy. 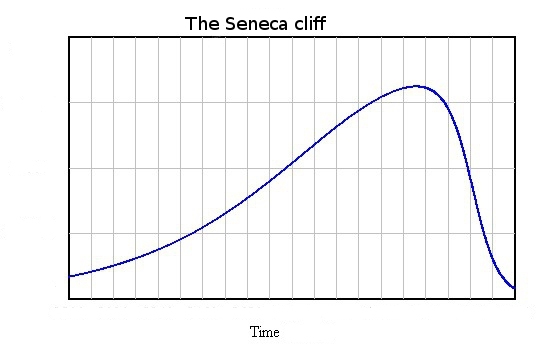 Much less energy along a declining scale, the bottom of which we have no idea where it will end up. More people going to church is probably a sign people are losing faith in the current system to support their needs and seeking a different type of venue to transfer that faith to, almost like a balancing act. The problem is as the squeeze continues more and more people will be living on the edge of financial disaster and one really big recession and the percentage of people on the skids will go up so dramatically the landscape of civilization will not look the same again, like the US economy didn’t look the same after the 08/09 mortgage meltdown. I think we aren’t near total collapse, but do think we are near that point in which millions upon millions fall off the rails so to speak. Expect the crime rate to rise exponentially after that happens which will put tremendous pressure on those still in the game. The Russians leave the famous Czech spa town Karlovy Vary (https://en.wikipedia.org/wiki/Karlovy_Vary). There are many houses left after their leave which fail to be sold due to their exaggerated expectations. In the past, the prices have risen to record level due to the low offer and big demand, now, it is difficult to understand for many owners that with the low demand their selling price expectations are exaggerated. Same with the elderly British trying to sell their houses in France and Spain: not much local demand. Which is, of course, exactly why they were for sale to the Brits in the first place…..
were Brits told that housing prices “always” go up? And the wine really was even cheaper. I know a few expat Brits who love(d) to fill up 20 litre plastic containers with plonk at the local winery, bring it back to the cottage in Provence or Catalonia and bottle it themselves. I understand that the Japanese government is the owner of a lot of otherwise unsalable rural properties in Japan. Perhaps governments of other countries need to try the same approach. I have heard that because of high taxes imposed when a farm is inherited by a child, the Japanese government is the owner of these properties. It is my understanding that the homes are allowed to fall apart (but I may be wrong on this). I don’t know what happens to associated farmland. I suppose printed money could be used for this purpose as well. Your understanding is basically correct. But there are big differences between small town and “out in the sticks” rural properties. In the towns, the land is often worth more than the buildings standing on it. The market value of Japanese homes declines rapidly and few people are interested in buying or living in old houses. So often the houses will be demolished by the owners prior to selling the land. A friend of mine disposed of their deceased parent’s house in a small city last year and they had a originally planned to demolish and sell the land, but fortunately a buyer for the house turned up and this saved them having to pay several million yen to the guys who knock down buildings and cart off the debris. But the buyer also gained as they paid only for the the land obtained a substantial good-quality 40-year-old house for free. Another friend has a nice 30-year-old home with all mod cons in a small city, and an older house that he built 50 years ago in a smaller town 20km outside the city. He has spent the past 30 years still maintaining the old house and tending the small garden, and as the owner he has continued to pay property taxes on it. But the house has a value on the market of Zero. There are no buyers. For many years he had a sentimental attachment to it and he thought one of the children might like to live there some day, and so he didn’t get rid of it while he could. Now he realizes that nobody wants it, he is at a loss as to what to do with it. In the countryside, population decline and the aging society are in full swing and it is extremely difficult for people to find new buyers for farmhouses with adjacent fields. The farmer’s kids have often grown up and left for the cities, so there is nobody to take over. Then when the older generation dies, the homestead is abandoned, in the case of traditional timber and dirt wall houses with thatched roofs, of which there are many, they go rotten and eventually collapse due to a combination of damp, mold, termites and snow, while all around the grasses and shrub trees take over. It can be quite spooky. Japan has been transforming from largely rural to largely urban living in recent decades. They are carrying out the kind of transformation that Britain did at the time of the Enclosures and the Highland Clearances, but doing it not with brutality but by creating a motivation for people to move. Yea, but they lost Crimea. It was 90% Russian anyway. And has been a part of Russia about as long as the US has been a country. Of course, the Russians could “give back” Crimea. Of course we could “give back” the States. 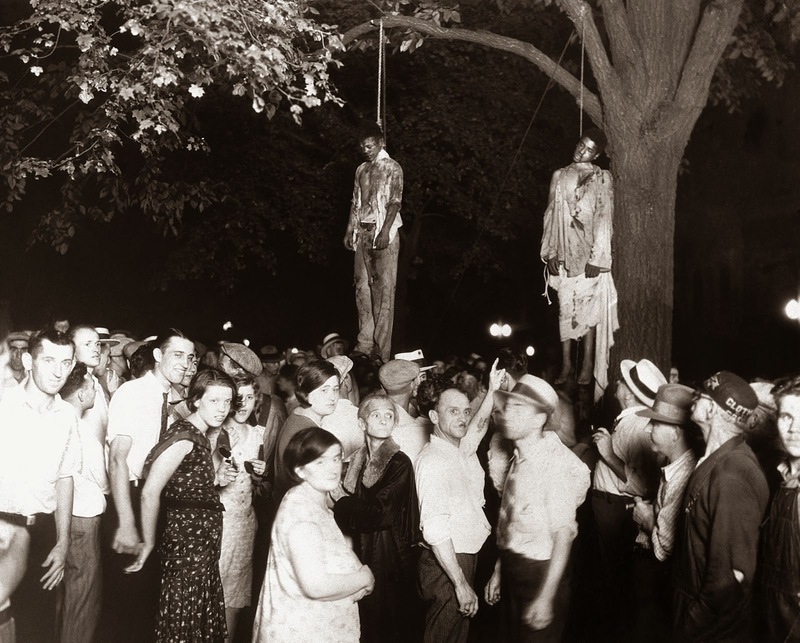 As far as a race issue, you are on the wrong page, obviously. The decline of the Middle East is inevitable. And who will want the heavy oil from Venezuela? This documentary particularly stresses the role of the newly found and developed Western Siberian oil in the 70s energy crisis, i.e. that this oil saved the Western World against the blackmail of the Middle East oil producing states. People who want diesel will want heavy oil from somewhere. Whether they can afford it is another question. I guess the Middle East with its rising own portion of heavy oil will not have free light oil for Venezuela. Moreover, when the Middle East theoretically starts to explore shale oil, it will be quite a costly business for them, which will keep prices too high for the consumers and too low for the producers. The same applies for Russia, but Russia is still better off with its water and food availability. Technologically, Russia seems to be also better off, thanks to its coal and nuclear availability and also skilled workforce on its own territory, close to the oil production places. As it was said many times before: Venezuelan oil is very capital, technology and investment intensive. With the price levels that are too high for the consumers, there is not much left for such a vast population as Venezuela currently has. It practically means that no one will risk repeated expropriation of its assets. Although Russia agreed to invest recently into Venezuelan oil (https://www.reuters.com/article/us-venezuela-russia/venezuela-signs-oil-gold-investment-deals-with-russia-maduro-idUSKBN1O51WX), there are many ifs. The situation of Venezuela sems to be a chronic status quo, which means that there will be no miracle return to the previous prosperity with the current level of population, which will be repeatedly igniting civil disorder. 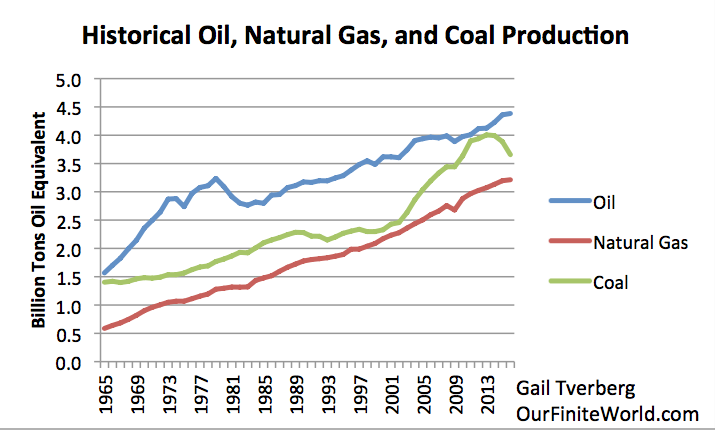 The transformation of the economy from oil dependency, i.e. the vast amounts of low skilled people into a technologically developed nation, is very painful and given the lack of other energy resource like coal and nuclear, practically impossible. You need some other energy resources like Russia has, to keep the economy operating. Firstly, Venezuela needs rebuilding its energy sector, building some nuclear. All this requires years of work and investment, which is hard to imagine under actual situation. Simply said, it is not just the investment into oil production, but the investment into the energy sector in general, that can mitigate the energy shortages in Venezuela. As was done e.g. by Argentina with its nuclear energy program after the fall of its oil production. 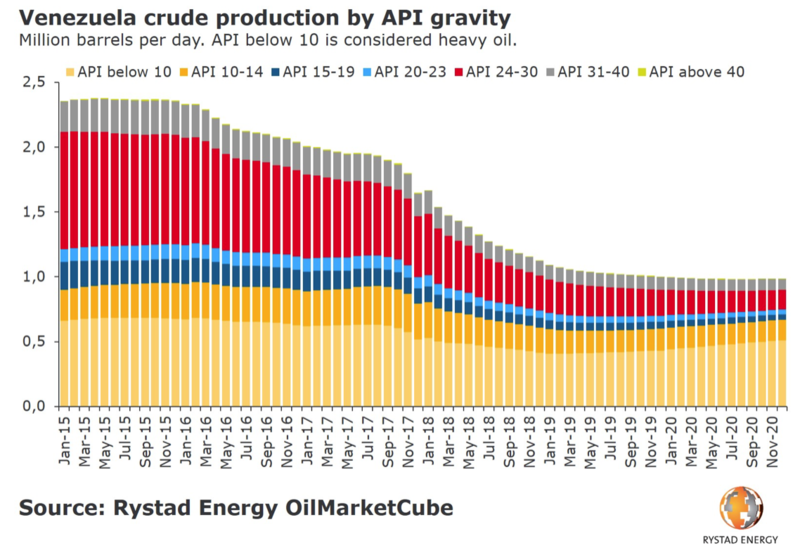 It looks like most of what Venezuela has been pumping recently has been heavy oil (with lower API gravity). It is the light oil that is not holding up. Some of the best ever– but it was the 60’s.